Wondering how your diet impacts the environment? If you’re eating animal products, it could be doing more harm than you may think, environmentally speaking. The Environmental Working Group has released information on the “cradle to grave” carbon footprint of 20 different kinds of conventionally produced animal products. Lamb, beef, cheese and pork take the top spots for worst carbon footprints. 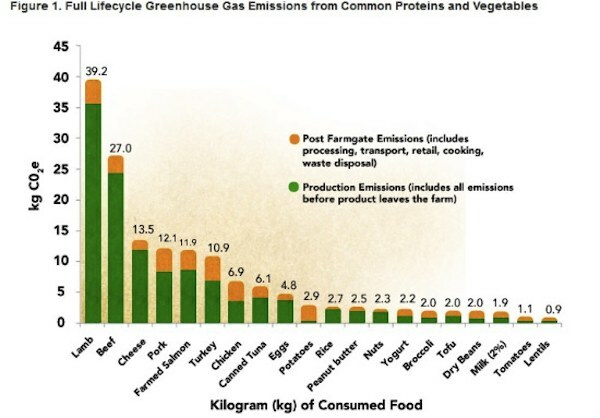 Yep, cheese, so if you’re a meat eater that eats dairy, you may not be as low carbon as you think. Lamb takes the top spot, with the researchers claiming that eating 4 ounces of lamb is equivalent to driving your car 7 miles. These foods generate the highest levels of greenhouse gases, mainly nitrous oxide and methane. If you’re a meat eater and know you’re never going to give it up, check out the “Helpful Tips for Meat Eaters” section that offers some helpful hints to live by to reduce your environmental impact. For example, eat grass-fed or pasture-raised meat, hormone, nitrate and antibiotic free meat, certified humane cuts, and low sodium meat, if available. The most important tip? Try eating less meat and dairy and more plants. If you’re still not on board with altering your diet but still want to see some change, the EWA suggest writing to your local political representatives to help pass laws regarding the policies and production that cause meat to be so environmentally damaging. It’s unrealistic to expect everyone to stop eating meat or even cut back significantly. However, if at the very least, those who still enjoy eating meat are willing to work toward a more sustainable industry that is healthier for them AND the environment, then it’s certainly a step in the right direction. Interested in taking the pledge to eat less and greener meat? Sign it here. I don’t understand why lamb should be so high. Sheep are often grazed on land unsuitable for cattle. It is hard to believe the sheep emit more methane than cattle. I’m also wondering why lamb rated so high. Is this because a lot of lamb has to be transported to the US from Australia/New Zealand after it is butchered? I am also stumped on this, I have seen other estimates that had lamb rating much lower than beef.